It’s not exactly news, but it is way past time to act on it. The data deluge is on. And x86 is in over its head. More powerful, scalable and reliable systems are needed to retrieve data from systems like ERP, SCM and HRM and deliver faster user experiences and broader opportunities for new products and tools. Power systems has a proven legacy of providing reliable infrastructures to run demanding applications. 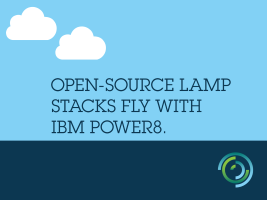 The superior security of the Power8 server results in a reduced number of intrusions and lower security-related costs compared to the x86.